Beatriz Milhazes brings a modern flair to Brazil — or, we can say, brings Brazil to the modern flair! Her work is often jarring, but it stands out and is both boldly beautiful, Modern, and Brazilian. 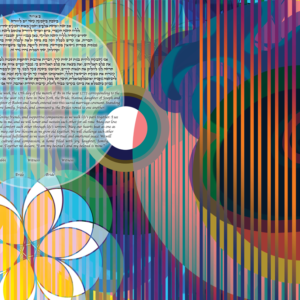 The Flower Symphony Ketubah is a great Ketubah for a couple that not only appreciates Brazilian art or spent a romantic time in Rio de Janeiro, but wants a Ketubah that calls attention to itself — so that anyone who sees it hanging on your wall will see your love memorialized in the wedding contract.